Never before have there been so many options to improve the looks and efficiency of your existing swimming pool. In the last 10 years alone, more than a dozen new developments have made swimming pool ownership more enjoyable, less expensive and easier than ever. We have a complete list of time-saving and energy-saving swimming pool upgrades that are available as upgrades for your swimming pool. 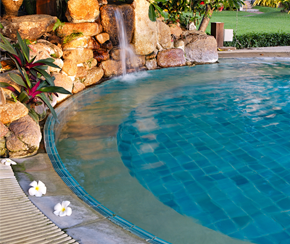 TIME-SAVING UPGRADES: Let Your Pool Care of Itself! From chemical management to automatic cleaners, new breakthroughs have taken the drudgery out of swimming pool ownership. Check out these options that are available as upgrades to your swimming pool. Automatic, every day. The pool always stays clean. ENERGY-SAVING UPGRADES: “Go Green” And Save Money Too! The industry has been working hard to develop more cost-efficient pumps, filters, lights, heaters and control systems. With the following upgrades, you can cut your swimming pool’s electricity usage by more than 60%. Uses 64% less electricity than single speed pumps. Uses 68% less energy than gas heaters. Extends the swimming season for just pennies a day. To find out what upgrades might be right for you and your pool, or to get a price quote, please call us or submit a request on line.